There are 6 posts filed in Liberia (this is page 1 of 1). On the first day of the UN climate negotiations in Paris, the governments of Germany, Norway and the United Kingdom pledged US$5 billion for REDD, between 2015 and 2020. The GNU countries say they “have signaled they will increasingly target results-based finance for countries who deliver verified REDD+ emission reductions”. How did DLH, a company trading illegal timber from Liberia, get Forest Stewardship Council certification? Last week, the Forest Stewardship Council announced that it was kicking out Danish timber giant Dalhoff Larsen and Horneman (DLH). FSC did so after investigations by Global Witness revealed that DLH had traded illegal timber from Liberia. Liberia’s defence minister, Brownie Samukai, told the UN Security Council this week that Ebola is “spreading like wildfire”. The international response so far has been slow and inadequate. A British company, Equatorial Palm Oil plc, plans to expand its oil palm plantations on community land in Liberia. The Jogbahn Clan is fighting to keep the company off its land – covering an area of 20,000 hectares. 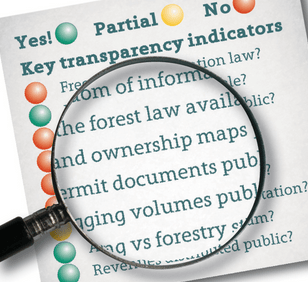 Since October 2008, Global Witness has been working on a project called “Making the Forest Sector Transparent”. The project has recently released its 2011 Annual Transparency Report, looking at the transparency record in seven countries: Cameroon, Ghana, Liberia, Peru, Ecuador, Guatemala, and the Democratic Republic of Congo.